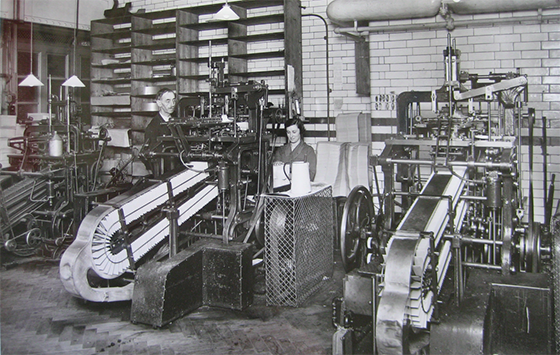 Are your email servers as busy as these envelope-stuffing machines or could you use a few more leads? Image source. Is your content marketing strategy working for your business, or would you like to generate more leads? Where do you start? How do you find the best ideas? This theory is the driving force behind all popular growth hacks, and it provides a solid framework for coming up with tactics to apply to any area of your business – including your content marketing. Here’s how optimizing for Shmukler’s three levers can help you craft a solid content marketing strategy that generates more leads. You can’t convert blog visitors into leads if no one is visiting your blog. And if you’re not strategic about the way that you attract your visitors, you may wind up with unqualified leads who don’t care about what you do. When Jayson Gaignard first started promoting his entrepreneur mastermind events, he drove thousands of visitors to his site, but they didn’t register for his event. Why? They weren’t the right audience. Here are some tactics that will drive (and convert) the right type of visitors: targeted visitors. When Maneesh Sethi wanted to build the email list on his productivity blog, he turned to guest posting to reach new readers. Hoping to drive 200 new subscribers, he wrote a guest post on Scott H Young’s blog. At the end, he added a link to a custom landing page where readers could download exclusive material… after they subscribed. After the post went live, Maneesh was blown away by the results. That 200 subscriber goal? He passed it the first day. 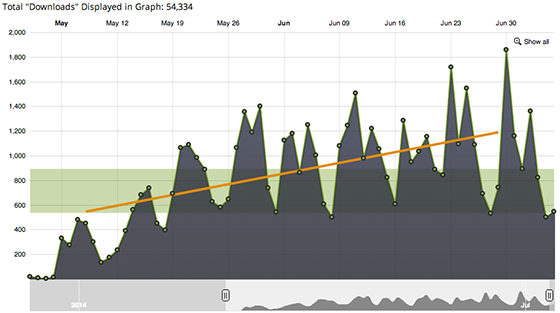 Within a couple of weeks, that single guest post drove 1070 new subscribers. Want more subscribers? Create a customized landing page for every guest post you write. Blog audiences are generally highly targeted, so guest posts on the right blogs can make big impacts – if you’re making it easy for people to subscribe. Being an active member of communities such as GrowthHackers allows you to learn, share ideas and get to know others in your niche. And after developing relationships there, these communities are perfect for sharing your articles, driving traffic and collecting leads. Armed with an idea for a new product, Perrin Carrell needed to prove that people would be interested in buying it. 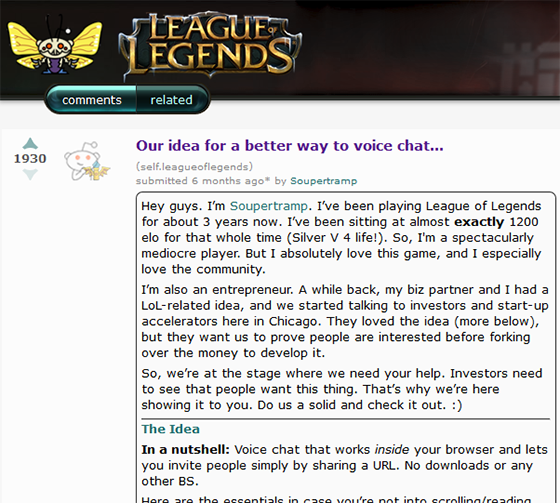 To do this, he decided to ask the League of Legends community on Reddit. Perrin Carrell’s post on Reddit. Image source. His post gained significant traction (over 1.9k upvotes! ), and over 6,300 people from the community joined Perrin’s email list. Find and frequent “subreddits” that are relevant to your blog topic. Pay attention to popular topics and comments – they can tell you a lot about your target demographic. Scott Britton knew that many people prefer podcasts over blogs, so he decided to start his own podcast: The Competitive Edge. Over just eight weeks, Scott built his podcast to over 50,000 downloads and climbed to the #1 spot on iTunes’ “New and Noteworthy” business podcasts. His podcast popularity also translated into email leads: during those 8 weeks he saw 2.5k new subscribers. Here’s what Scott’s downloads looked like over the first 8 weeks. Image source. So how did Scott launch his podcast into such “instant” success? Long before he even published his first episode, Scott carefully planned his growth strategy and laid the groundwork for an explosive launch. Get as many downloads as you can in the first 8 weeks to be featured on iTunes’ “New and Noteworthy” chart. That’ll put your podcast in front of thousands of new prospects. Ready to get started? Grab a microphone, Skype a friend, and record your first podcast today! When I first started my blog, I got maybe one new subscriber for every 100 visitors. It was pretty terrible. Now, I’m getting about six. I’ve still got a long way to go, but it’s a lot better than before – in part because I have removed a lot of points of friction for visitors. My MailChimp email list grows as I optimize my blog for coversions. The really exciting thing about reducing friction on your blog is that each gain you achieve will affect all your posts – even the ones you haven’t written yet! When writing CTA copy, you shouldn’t be relying on your intuition and praying that your brain is better than average at predicting user behavior. 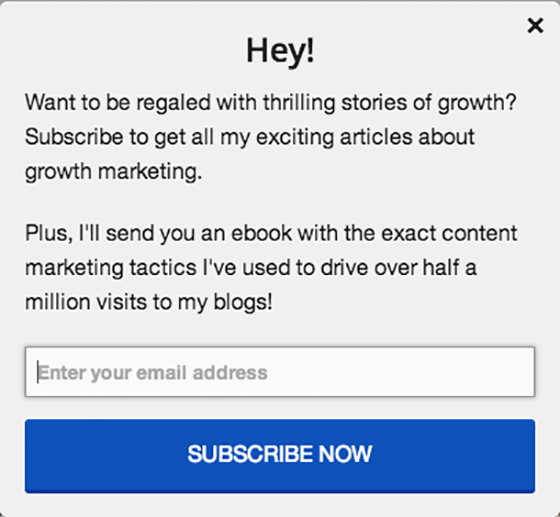 Instead, use A/B testing to measure exactly how subscribers react to different button copy or headlines. 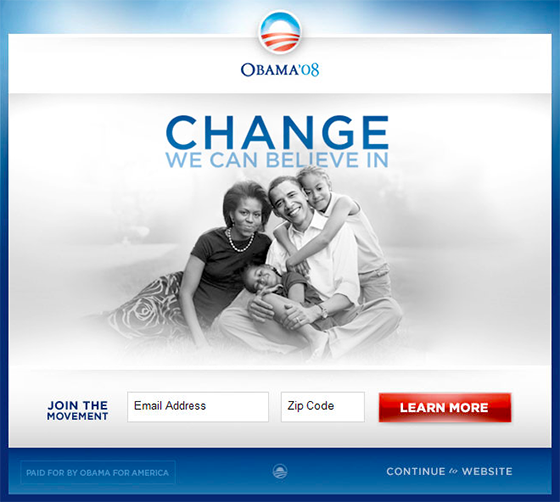 During the 2008 presidential campaign, Obama’s team wanted to build a large email list because they figured subscribers were more likely to volunteer, donate, vote and otherwise support the campaign. This is what the original form looked like. Image source. To get more email leads, they used A/B testing to measure the effects of 24 different landing page designs. 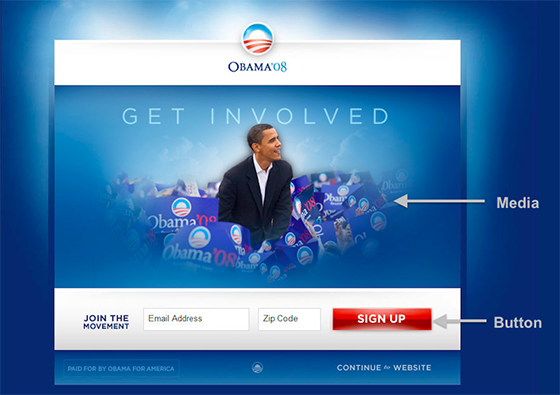 Using multivariate tests (meaning they changed multiple elements), the Obama For America team tested variants of both the sign-up button and the media hero shot. This winning treatment increased email sign-ups by 40.6%. Image source. The winning variation (pictured above) increased email sign-ups by 40.6%. Sounds like an impressive number, but what does that actually mean for Obama’s campaign? Over the course of the campaign, that optimized sign-up form resulted in 2.9 million extra email subscribers and $60 million of extra donations. Want more leads? A/B test your opt-in forms. It worked for Obama. Your opt-in form may have attractive design, but you’ll never know what works best until you test for yourself. Go crazy. Test your calls to action, headlines, imagery and placement. If you need some inspiration, Michael Zipursky has some for you in this post. As humans, we want things that we can understand; the simpler something is, the more comfortable it makes us. Gestalt psychology describes this phenomenon in the Law of Prägnanz. So how can you leverage our love of simplicity to increase email sign-ups? Derek Halpern experimented with this law by testing three different variations of his sign-up form. The three variations: control, variation 2, and variation 1. Image source. Variation 1 (right) used the principle of social proof by encouraging people to “Join 14,752 others.” Variation 2 (middle) applied Prägnanz by simply cutting the social proof and keeping the form short and to the point. The control (left) added slight variations in the headline. Knowing the power of social proof, I originally guessed that variation 1 would win – after all, who wouldn’t want to join 14,000 others! But the Law of Prägnanz (or simplicity) carried the day in this case. Simply eliminating the social proof completely let potential subscribers focus on the form. The simplest variation of this form drove a 2% conversion rate – 102.2% better than the variation with social proof! When designing email sign-up forms and landing pages, reduce friction by simplifying. The key is to find that sweet spot between communicating the benefits of signing up and not creating too much friction for potential subscribers. Your visitors can’t subscribe if they don’t see your sign-up form. Sounds like common sense, right? But how many visitors notice that little subscribe box stuck between popular posts and sponsors on your sidebar? Or that little “I want more” button at the bottom of your post? Right now, many of your visitors could be missing your sign-up form. When I realized this, I decided to try an email pop-up plugin that would make my email form more noticeable. 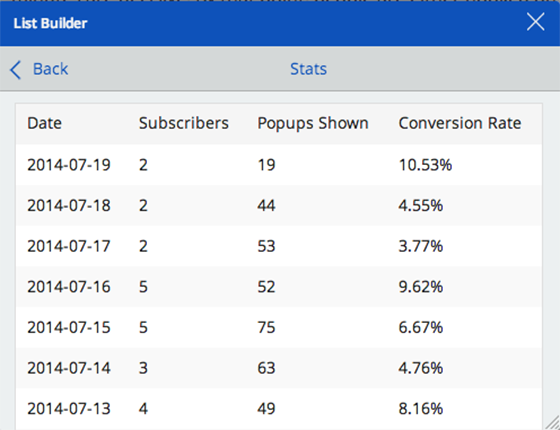 This variation of the pop-up converts about 6.4% of my new visitors to excited email subscribers waiting for my next post. Results from a week of pop-ups. Only showing the pop-up on certain pages. Only showing the pop-up to first-time visitors. Is it easy for prospects to sign up for your blog? Your pop-up doesn’t have to be annoying. Once you’ve built exposure and removed friction, you must also have sufficient incentive. What’s the incentive for your website visitors to join your email list? And how can you make it stronger? When you ask people to subscribe “to get more articles like this” what’s the incentive? You’re asking them to join for some amorphous reward in the unknown future. It’s not a horrible incentive, but it could be a lot better. 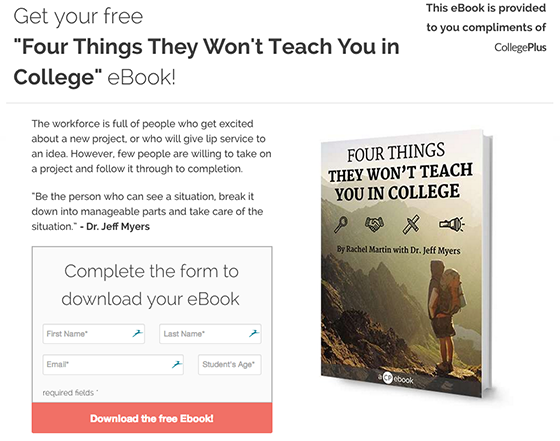 When you ask people to subscribe “to download Four Things They Won’t Teach You in College” what’s the incentive? You’re asking them to join to immediately download a massively valuable ebook. See the difference? Using an ebook as an incentive promises immediate value and provides a more concrete call to action. Writing an ebook might seem like a daunting task, but it doesn’t have to be. Not if you pace yourself. Just break the process down into little parts and tackle it one day at a time. Remember, even elephants can be eaten one bite at a time. When done right, running a webinar can give a major boost to the size of your email list. And it doesn’t need to be that hard. The urgency and value of a webinar pack a powerful one-two punch that will convert many of your website visitors to attendees (and get them on your email list). After the event, you can share the recorded video and perhaps even turn the audio into a podcast. 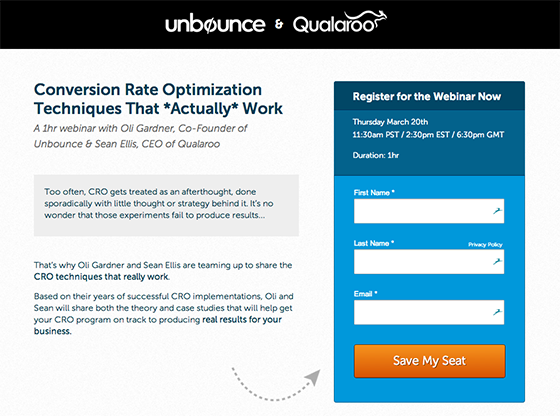 An Unbounce webinar landing page. Frustrated by the performance of his initial incentives, Derek Halpern used a webinar to drive email sign-ups on his website. He planned the event, created a landing page, and in just 28 days he drove 1054 new email leads. Even beyond just building raw subscriber numbers, webinars give you an opportunity to build a relationship with new leads – resulting in a highly responsive email list. Engage them before, during and after the event. Create a feedback loop and ask them what they’d like to learn about next. Check out this post for a great crash course to creating a webinar of your own. You can provide massive value with an ebook, but what if your ebook is about landing page design and your visitor came to read an article about Facebook ads? Your visitor might not see the value unless it’s relevant to what they’re looking for. And that is the power of post-specific incentives. If you’re a reader of Noah Kagan’s blog, you might have noticed this before. In some of the posts on his website, he uses post-specific bonus content that’s directly aligned with the topic of that post. In the above example, from a post about marketing books on Amazon, he included a massive pack of bonus content. When you click the download button, it asks you to subscribe and get the bonus material. Unlike ebooks, bonus material shouldn’t take too long to put together. Think about resources you already have at your disposal. Email scripts, spreadsheet models, cheat sheets, recordings, and resource lists all make great incentives. Optimizing for these three levers (increased exposure, reduced friction and increased incentive) will help you collect more leads, but long-term subscriber growth boils down to just one thing: keep creating great content. No matter how well optimized your content marketing strategy is for growth, success won’t come overnight. Success comes after years of hard, thankless work pouring your heart out in every article you write, guest post you pitch and podcast you create. It’s not easy, but your leads will thank you for it. And when is anything easy ever worth it? Nate Desmond is a self-proclaimed data geek who’s excited by analytical marketing. Just for Unbounce readers, he's put together an exclusive resource kit with checklists and case studies to make you a smarter marketer.